For keto dieters who are having trouble meeting their protein quotas, supplementation may provide the solution. Unlike other supplements, protein powder is widely used and regarded as being effective for helping you achieve your workout goals. A protein drink consumed along with a carbohydrate-based meal can also help prevent high glucose levels. But, this doesn't mean carbohydrates in a protein supplement are a good thing. The carbs found in most protein supplements are designed to be quickly absorbed, which can increase blood sugar. Many protein powders contain carbs though, so it's important to look at the ingredient list to pick a powder that is suitable for a keto diet. Protein provides a primary source of energy, especially on a keto diet. While you want to ensure you're not taking in too much protein, it's also important that you achieve the right balance in your diet to ensure your keto macros are fulfilled. The biggest problem that most keto dieters will face is finding a protein powder that fulfills their goals while still allowing for the consumption of real food. Not all protein is created equal and using a protein powder can ensure you're getting your amino acids and other nutrients at the proper level. Keep your macros in mind as you choose a protein powder. Remember that the average keto diet seeks to maintain fat at 60-75 percent of total calories, protein at 15-30 calories and carbs at 5-10 percent of calories. With this in mind, you should select a protein powder with virtually no carbs. While you might think a protein powder is going to consist only of protein and not contain extra carbs, you'll be surprised how many carbs there are once you begin looking. Ideally, whey protein powder offers the best option for a keto dieter. Beef protein also exists, but it is typically more expensive and whey has a long history of use in bodybuilding and other sports. While whey works for most people if you have an allergy to whey then you need to choose a plant-based or soy option. Of course, this means your supplement will have additional carbs. The Journal of Sports Medicine published a research study on the effects of protein supplements on muscle damage, soreness and recovery of muscle function. They are careful to note people often purchase protein supplements based on marketing claims that are necessarily steeped in evidence-based research. The study didn't find that protein supplementation helped muscles to recover more quickly, but it did find that protein was effective in reducing muscle soreness when protein supplements are consumed after a workout. While that may not sound like an argument for the use of protein supplementation on a keto diet, there is one important factor of the study that makes supplementation very important for keto dieters. When the subjects were negative in nitrogen or energy balance, supplementation did show a positive effect on physical performance, stamina and recovery. For the keto dieter, this is important because protein needs to be supplemented in a way that helps dieters to maintain lean muscle mass and energy levels. The Natural Medicines Comprehensive Database rates the effectiveness of protein powder as possibly effective for eczema, allergies, weight loss in people with compromised immune systems and psoriasis. The American Journal of Clinical Nutrition notes that protein powder is more effective in untrained athletes than it is in trained athletes for increasing muscle protein breakdown and synthesis. However, for the greatest effect, protein should be given after exercising. There is little debate about the effects of protein on a diet that is lacking in the vital nutrient. Protein serves as the building blocks of muscle, which can help you maintain and preserve muscle mass. However, if you take too much protein, you will negate the positive effects of a keto diet since the body will turn excess protein into glucose. For the keto dieter, it makes sense to try to include plant-based proteins into the diet. This gives you some of the benefits of plant-based foods that may be missing on a ketogenic diet while ensuring you're not overdoing your macros. Protein preparations can be added to baked goods to increase the protein content. However, the best way to take the powder is to ingest it in the form of a liquid. Some protein powders are difficult to digest because they taste so horrible. With enough exposure, you'll be able to get used to the taste of protein drinks and there are quite a few products that don't taste bad. For the best results, you should drink the protein powder after exercising. After you finish a workout, your body is primed and ready to absorb nutrients. Studies have found that protein supplementation works best when taken immediately after working out. Whatever you do, avoid using a product that contains many carbs. Because protein powder is specially designed to be absorbed quickly, the boost in carbohydrates can wreak havoc on your glucose levels and kick you out of ketosis. There is some evidence to suggest that high protein intake may contribute to loss of bone mass and kidney problems. However, this only applies to people who already have kidney problems and there is virtually no evidence that supports the idea that high protein is detrimental to healthy individuals. Additionally, high-protein intake can decrease hunger and improve metabolic pathways. For most people, protein powder doesn't provide any negative side effects. There may be a slight increase in gas while the body gets used to consuming large amounts of protein. If you have an allergy to certain types of protein powder like whey or casein, that's also going to present an issue for you. Since the keto diet may lack certain nutrients that you can only get from plants, this plant-based protein powder can make the keto diet even more effective. 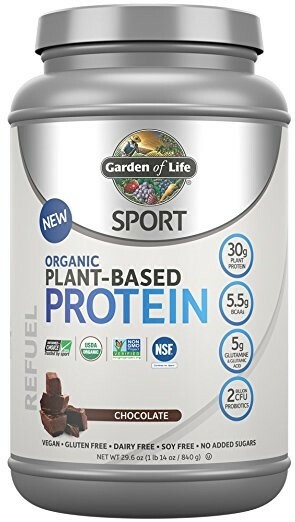 With 20 grams of protein and the most vital nutrients from several different plants, this option will give you an exceptional level of nutrition. You'll get some serious green energy thanks to the organic greens and juices, and if you have allergies to other protein powders this option should be tolerated extremely well. Contains 20 grams of protein with minimal carbs. Offers many of the nutrients obtained from plants. Includes vitamins that may be missing from a keto diet. Contains less than 1 gram of sugar, but this should have a minimal effect on your system given the high level of protein. While this option doesn't contain as much protein as our top pick, it does offer a high level of BCAA amino acids. You'll get five grams of BCAA amino acids, which are critical to ensuring the body can adequately recover from workouts and maintain itself on a keto diet. This product also contains beneficial probiotics, which can help ensure your body absorbs more of the nutrients in this drink. Combine this powder with a dedicated probiotic supplement, and you'll have more energy that you know what to do with. Includes a detailed breakdown of amino acids that are included. Contains 15 grams of protein. Includes vitamins that are essential for good health. Includes 1 gram of sugar, but the sugar comes from fruit-based ingredients you normally couldn't include on a keto diet. Now Sports has won several awards for its high-quality supplements. This product is a good option for getting a large amount of protein with minimal carbs. It is made from pea protein, so you shouldn't experience any allergic reactions to any of the substances within the product. It is also free of soy and dairy products. 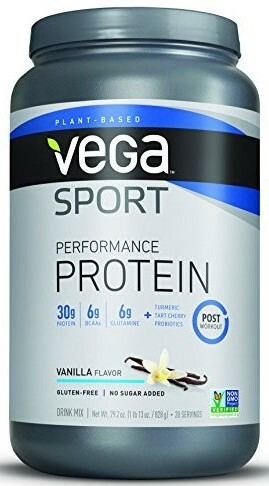 This is a good product if you just want protein with nothing else added. Pea-based protein offers a low-carb, high-protein option. Perfect for those who have allergies to traditional proteins. Doesn't include much in the way of vitamins or other nutrients. The full serving size contains 30 grams of protein and 6 grams of BCAAs. This offers a complete nutrition source that will give you a high-quality plant-based protein. 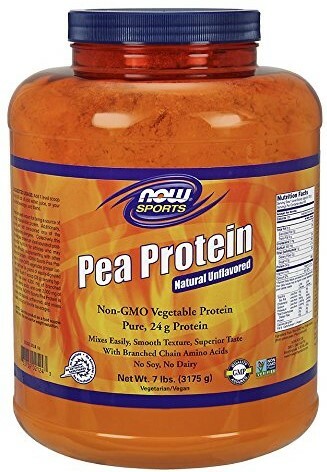 It uses protein from pumpkin, pea, sunflower seeds and alfalfa. You'll also get probiotics with this supplement, so it's more similar to some of our top picks. It would be rated higher but in terms of micronutrients, this product is somewhat lacking in vitamins. Since you have to make the most out of all your calories on a keto diet, it's important to maximize your nutrient intake if you're going to consume carbs. Offers 15 or 30 grams of protein depending on your serving size with very few carbs. Plant and seed-based protein are suitable for people who are intolerant of whey. Contains an impressive number of probiotics for increased absorption. Contains virtually no vitamins or minerals with the exception of calcium and iron. BlueBonnet makes some great nutritional products. This particular option is a no-frills protein powder that contains both whey and casein. In many ways, casein is considered an ideal protein. While whey is absorbed by the system within an hour, casein is a slower-acting protein that can take up to four hours to get absorbed into your system. This makes the combination of whey and casein a smart choice since you'll get the immediate influx of protein from the whey and the casein will continue to fuel your body for a few hours. 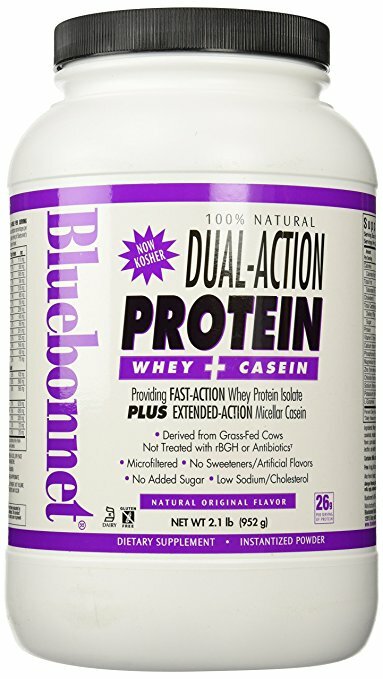 Offers an impressive amount of protein and uses both whey and casein. Includes a good selection of vitamins. Sugar content is 1.5 grams. Choose a supplement that offers the amount of protein you need to meet your dietary goals. Since you're on a keto diet, you likely won't want to ingest a massive amount of protein on your diet. Most diets consist of only 20 percent of their total calories coming from protein. Going with a low-carb plant-based support can help you get some of the additional nutritional benefits that are typically only found in high-carbohydrate foods. 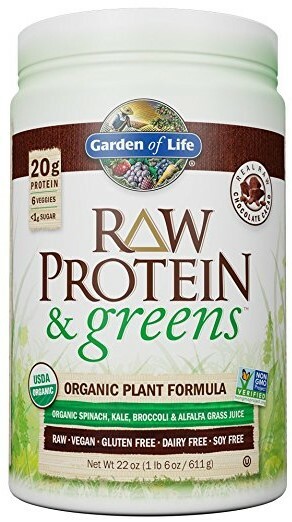 Our top pick is Garden of Life Greens and Protein Powder because it gives you a high amount of protein and it includes a variety of other nutrients that will help you enjoy the keto diet in a healthier manner. Not only will you get a substantial amount of protein with virtually no carbs, you will also get probiotics and the vegetables that you can't typically include in a keto diet.